For a long time now, Android users have been enabled to choose if they should be alerted about various emergency and life-threatening situations. This can potentially come in pretty useful for those users who live in or near hazardous areas, regions where various natural disasters are a common occurrence, and others. Said emergency broadcasts are being automatically sent to users in an endangered region over the GSM or UMTS networks, usually to many cell towers simultaneously. 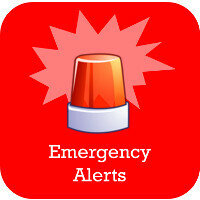 When a disaster occurs, you'll get notified by a brief emergency message. Your phone might or might not also ring loudly and vibrate in order to attract your attention. Undoubtedly, that's a functionality that you'd rather want to stick with - by default, it's turned on 99% of all Android devices, hidden at plain sight in a menu flaunting the "Cell Broadcasts" name. That said, due to reasons unknown, there might be a folk or two that don't want modern-day technology to alert them for life-threatening occurrences in their area. We'll show how to disable, or respectively, enable said cell broadcasts alert feature in the latest version of Android. Head to Settings and tap on the "More" tab at the end of the Wireless & networks tab. Once inside, swipe to the bottom and hit the Emergency broadcasts button. We're here! Now you can select what type of events to be alerted for. You can enable alerts for extreme and severe threats, child abduction alerts, and even experimental warnings for deadly tsunami waves. Select or deselect entries as per your liking. You can also define how your phone notifies you in case of emergencies - the duration of the alert, an optional reminder for the event, and several others. That's it! Remove battery from smoke alarm as the low battery indicator is annoying too! An 'Emergency" for one person means nothing for another. I couldn't care less if California fell into the ocean: I live elsewhere. I don't need to be told about bad news that doesn't effect me. Or maybe I'd prefer to die instead of live through a disaster. I just turn it off because I value privacy more than safety. Wish my att g3 had this. Last time it woke me up at 3am got a notification about strong winds and that it was gonna be some floods and heavy rain. Scared the hell out of me the alarm was loud . How dare you inform your comrade citizens how to disable alerts by our Dear Leader? Off to Guantanamo you!